During the “Century of Humiliation” from 1839 to 1945 China was taken to its knees by foreign imperialists. The country was carved up, exploited, looted, raped and dethroned as the world’s greatest superpower. Only in 1949 when the communists triumphed over the Kuomintang in the civil war did China become whole again and begin the road back to its former greatness. This is the Communist Party’s narrative of history. 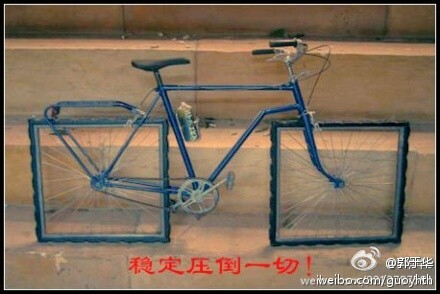 It’s the message that’s taught in textbooks and reinforced in the media, museums and movies every day throughout China. The elephant in the room that this narrative ignores of course is what happened for the first 30 years of communist China. And it also ignores the damage done by wholly domestic forces during the Century of Humiliation. The below charts show the relative death tolls inflicted on China by domestic and foreign forces over the past two centuries. The first breaks down the major deadly events. Getting an accurate count on these events is notoriously difficult*; especially when looking back to the 19th century. But even when we look at the range of estimates the picture is pretty obvious. 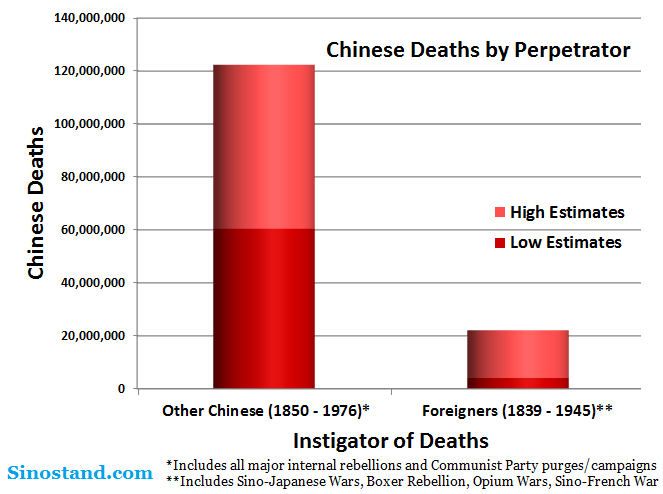 The next chart shows when we combine these events into a simple Chinese vs. foreign-caused death comparison. 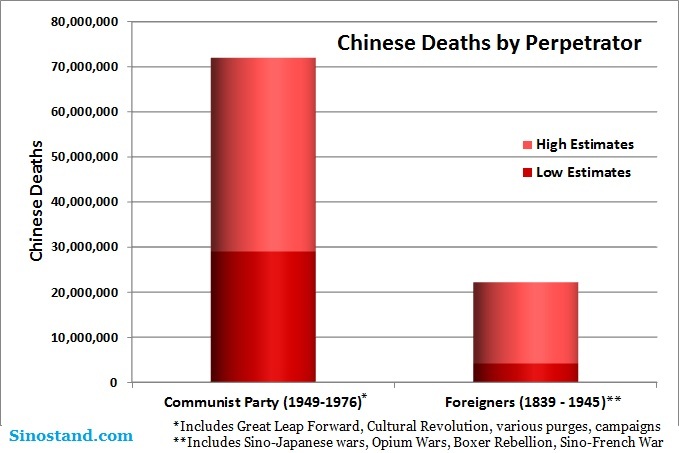 Here’s what it looks like when you just compare deaths caused by the Communist Party’s policies to the events of the Century of Humiliation (This graph doesn’t include the Communist Revolution). 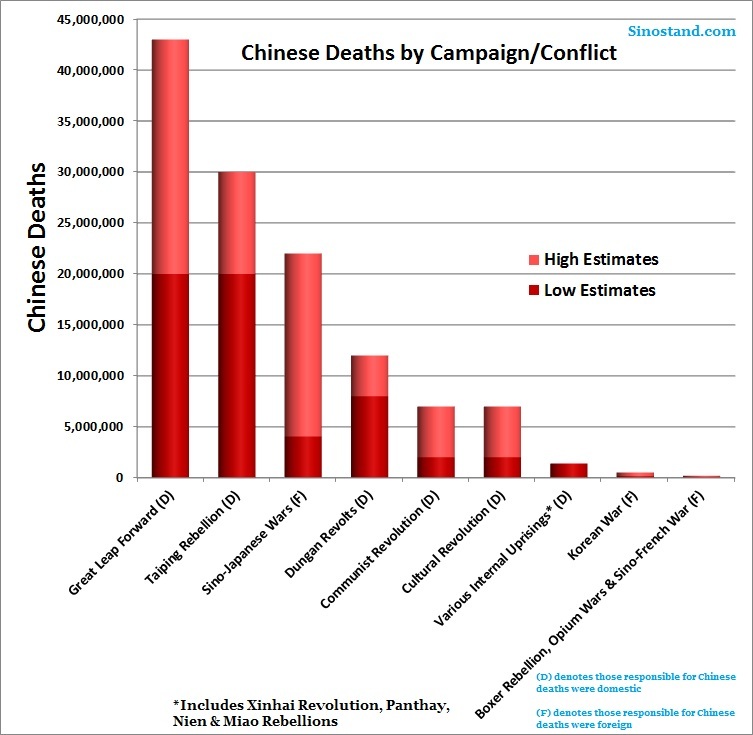 In just 27 years the Communist Party managed to kill significantly more Chinese than all the foreign aggressors did in the previous 106 years combined. Now in many ways these graphs miss the point. Killings were only one of the grievances over the Century of Humiliation. The damage done to the Chinese psyche was caused more by foreigners stealing territory, imposing unequal treaties, looting cultural relics, exploiting Chinese people, and of course, the heinousness of Japan’s war crimes. But making other considerations goes both ways. During the party’s first 30 years it took the personal property and land of millions, destroyed countless historical relics, denounced and humiliated people for the crime of being intellectual, and enabled violence often every bit as vile as what the Japanese committed. But these death tolls simply provide one objective measurement of the damage caused to China, and they have some important implications. However, to acknowledge that much of what derailed the country in the first place was home-grown violence would take a lot of wind from that idea’s sails. So would the implication that the rescuer (the CCP) did far greater damage to the country than those it needed rescuing from. These numbers also matter for low-level foreign relations. Chinese businessmen have been known to invoke the Century of Humiliation as leverage with Western counterparts in getting a better deal. You’ll sometimes even hear common street vendors use historical grievances to justify overcharging foreigners. There remains a strong sense that China is still poor because foreigners set China’s progress back a century. So when there’s a chance to balance the scales a little bit, some try to seize their due compensation. *The main sources for these charts are listed on necrometetrics.com here and here and were compared to a few other independent estimates to get a reasonable range. Some of the “various internal uprisings” have very scant data with only a single (likely unreliable) number though and should be taken accordingly. The party chief of one of China’s largest metropolises and member of the all-powerful 24-man Politburo went for a meeting in Beijing. Little did he know, he wasn’t to return home. He was sacked from his positions and awaits certain imprisonment. This is widely regarded as the result of factional party infighting ahead of a coming leadership shuffle and has been dubbed a “big bomb” for Chinese politics by one analyst. But wait. This isn’t 2012 and we’re not talking about Bo Xilai. It’s 2006 and I’m describing former Shanghai Party Secretary Chen Liangyu, Jiang Zemin’s old “Shanghai Clique” brethren. He found himself on the wrong side of a politically-motivated corruption investigation launched by Hu Jintao’s Beijing clan while posturing for the following year’s 17th National Congress (China’s mid-term leadership shuffle). At the time, foreign media sank their teeth into the sensational political drama. But wait. If we rewind further to 1995 we find that Beijing mayor and Politburo member Chen Xitong was taken down for corruption and embezzlement. He was in the Beijing faction and a rival of then paramount leader Jiang Zemin. Oh, and the scandal unraveled following the mysterious death of one of Chen’s close associates. Bo Xilai’s unfolding scandal is very similar to these past instances, but of course it’s different in one critical way: A lot of Chinese people know about it. Yesterday morning it was the talk of the Beijing subway and a Chinese friend told me politics has replaced celebrity gossip around her office water cooler. This has forced the government to face the public with the scandal to a degree never before seen. On April 10th, China’s official Xinhua news agency released a short, but explosive statement announcing that Bo had been officially stripped of his titles and his wife was suspected in the British businessman’s murder. The embarrassing thing for Xinhua (and ergo the government) was that Reuters had broken this news hours earlier. And microbloggers on Weibo reported it (in one form or another) hours before that. In fact, the whole Bo saga unfolded on Weibo as the state media released only occasional terse statements. When the Chen Liangyu scandal hit the light of day in 2006, there were about 130 million Chinese internet users and precisely zero of them were microbloggers. Today, over 500 million Chinese are online and half of them microblog. Imagine what those numbers will look like at the next leadership shuffle in 2017. One can’t deny the sensational theatrics of late night foreign embassy runs, a dead (possibly ex-spy) foreigner, and a flamboyant neo-socialist. At its core though, Bo’s case is hardly unprecedented. But if we look back at the cases of Chen Xitong, Chen Liangyu and now Bo Xilai, we see that each incident has shaken the central party apparatus successively harder. The party has been thrown off balance, but at the end of the year it will in all likelihood still be standing with its new leadership. But when China’s shadowy power politics inevitably spill out again into the increasingly connected and decreasingly trusting public, can things possibly remain as stable? With the recent Bo Xilai saga, fault lines in the façade of Communist Party unity are emerging in a very public way. After the split between the Zhao Ziyang reformist camp and Li Peng’s hardliners in 1989 emboldened Tiananmen protestors, the Party now rightfully worries about the public sensing any weakness in the top leadership. Even if the events around Bo hadn’t unfolded, the party would still be very much on edge. Later this year it will pass the torch to a new group of authoritarian leaders; and it’ll do so amid simmering social tension and unprecedented channels of mass communication. To protect itself, the party has recently taken measures demanding loyalty and respect for its relevance. Army personnel, lawyers and students are real threats to the party. Student intellectuals were behind the Tiananmen Square uprising. Lawyers tend to have an affinity for the written law rather than the whims of leaders – which undermines authoritarian rule. And the military, well, they have guns. The last group is especially worrisome. The PLA, by law, is bound to protect the Communist Party first – not the country. Calling for the army to be loyal to the nation rather than a single political party was one of the things that landed Liu Xiaobo in jail. For a party which then had neither socialist nor democratic-based legitimacy, the loyalty of the military was the only guarantor of continued rule. Jiang listened and did manage to stay in the good graces of the military throughout his tenure by consistently increasing military spending and taking a hard-line on Taiwan. When Hu Jintao came to power he continued the military buildup, but took a softer stance on the island. The Beijing-friendly Ma Ying-jeou was elected president in 2008, allowing Hu to engage Taiwan culturally and economically – which tacitly took a military takeover off the table for the foreseeable future. This wasn’t good news for PLA hawks anxious to use their toys. Last year, the PLA gave a subtle indictment of Hu by launching an unannounced test of the new J-20 stealth fighter during a visit by US Defense Secretary Robert Gates. Xi Jinping will take control this year lacking even the degree of support from the military that Hu has. He’ll likely have to spend at least the first year consolidating power and PLA loyalty – assuming the leadership transition goes smoothly to begin with. But if the factional fractures become too deep, military hawks could decide to settle the matter themselves. Translation: People are starting to think beyond what they’re told – and that’s bad news for the party. Imagine your town’s party secretary said your home would be demolished to make way for a public water park. You have the option of accepting cash worth far less than the market value of your home or taking a worse apartment several miles out in the boonies. After demolition, it’s announced that the water park plan will be scrapped and expensive luxury apartments will be built instead. You and the residents cry foul and seek help from local courts and media only to find they’re under the thumb of the same person who took your home. So some people try contacting Hong Kong’s Phoenix TV, where they’d seen corruption exposés before. Days later, Phoenix TV’s service is cut from the whole city. You consider going to the provincial capital or Beijing to petition. You seek advice from friends in other cities but they retell stories of people getting fired, harassed, detained or even killed for trying to do this. You decide giving up is probably the smartest choice. For all the attention we foreigners call to instances like this, relatively few Chinese actually experience them. Most go on normally with steadily growing incomes, so it’s understandable that they don’t want a political shake up. I recently talked about this with my girlfriend’s father – an admitted laobaixing (commoner) – who agreed that freedoms and political reforms are luxuries too risky to trifle with. This wouldn’t be surprising except that a few years ago he and his neighbors went through the exact situation I just described. I asked how he of all people could still be averse to political reform. He replied that he had indeed been screwed, but if the kinds of freedoms I was talking about were allowed, the Communist Party would collapse and there would be chaos. If things ever do get really terrible, THEN the government can make reforms. But for now, it’d be a pointless risk. Scenario 1: Local party cadre takes bribes, levies illegal taxes and uses his power to favor businessmen he has guanxi with. Everyone below him knows this but he doesn’t care. He’s elected from above and has control over the town’s police, courts and media. He knows that less than 3% of corrupt officials go to jail, because even if his superiors catch wind of his transgressions, they’d just assume not dirty their hands unless they’re backed against a wall. Indicting him could be an indictment on themselves and the system that feeds them. Scenario 2: Local factory poisons a river. Local party secretary (who has perhaps been bribed by the factory) prevents local media from reporting it in order to keep his job and city stability. Stability is indeed maintained and, operating on the precedent of impunity, the factory continues to pollute the river. Commoners are getting sick and some are dying. Perhaps they connect the dots and take to the streets. Perhaps they don’t. Very plausible ending to the story: The national government lets some egregious cases get reported, but they bury most small scale incidents like this (if they even find out) in order maintain public confidence and stability. People therefore see very few examples that might help them connect the dots in their own local situations. This happens repeatedly up and down the river and many others for several years to the point that the water is now unsafe to even touch; much less drink. China’s Ministry of Environmental Protection has acknowledged this is already the case with HALF China’s lakes and rivers. Similar circumstances unfold with medicine, food, infrastructure safety, air pollution, and deforestation. Try as they might to stop it with their “iron fist,” the central government’s internal policing is about as effective as fighting a cornfield mouse infestation with a baseball bat. Cases like Sanlu that are patently obvious to the whole country get wide attention, but most situations fester slowly out of the public view until they’re well beyond the point of no return. Eventually these things compound and millions get screwed, thirsty, hungry or poisoned. As people often do when they’re screwed, thirsty, hungry or poisoned, they revolt and the government’s attempt to keep social stability has backfired tremendously. Scenario 3: In the wake of the 2008 financial crisis, the national government wanted to ensure social stability by keeping high investment and GDP growth, so it pushed down interest rates and engineered a lending boom that expanded the country’s money supply by two-thirds. Keeping money in the bank became pointless for the rich since interest rates are below inflation rates. Many people (especially those who’ve come into their money illegally) stash their money by buying multiple apartments. Thus there is huge demand for high-value real estate. So we return to local party secretary who needs some quick money; maybe for himself, but maybe just to achieve the kind of raw economic growth demanded of him by national leaders who see 8% annual growth – no matter what – as the key to keeping stability. So he does this the easiest way he knows how: tearing down old cheap apartments and selling the land to developers to build luxury apartments nobody will ever actually live in. Very plausible ending to the story: local party bosses across the country do the same thing until there are more luxury apartments than people can possibly buy. Prices crash and people who’ve already bought these homes lose their massive investments. Developers who haven’t yet sold their new buildings default on their loans en masse. This has a domino effect which causes much of the other $2.7 trillion in recent loans to go bad. Rumors spread on the internet that banks are running out of money. Official channels deny this but people have long since stopped believing the stability-maintaining cheery propaganda. So commoners swarm to withdraw their savings and start hording goods. This causes even greater inflation and regular Chinese suffer worse than at any point during the 2008 financial crisis. The government’s attempt to keep social stability has backfired tremendously. Scenario 4: In order to keep social stability and firm support, the government bases its education system on making students obedient. It teaches them to accept the material without challenging it. This material often includes subjective nonsense, so students are trained to think in a way to find the safe answer rather than the true or innovative answer. This begins with politics and history classes but spills over into other subjects. Students are afraid to express ideas beyond the status quo and teachers are afraid to teach them. Meanwhile, international collaborative platforms like Twitter are blocked or heavily censored (in order to preserve social stability), so Chinese researchers are kept in a virtual cocoon. Manufacturing wages are starting to rise, so China’s economy needs to move up the value chain like Japan’s, Taiwan’s and Korea’s did before it. But because of the education deficit and lack of intellectual freedom, China isn’t equipped to do this. Very plausible ending to this story: As this decade nears an end, demographic shifts put huge pressure on the young working generation as they must support aging parents. China’s best and brightest see the writing on the wall so they go overseas to get educated – where they mostly stay after graduation. China’s “Indigenous Innovation” initiative relied more on protectionism and siphoning last year’s IP from foreign companies than it did on creating the right conditions to innovate at home. Under the standard policy of throwing money at a problem, several of the most brilliant Chinese minds manage impressive accomplishments in spite of the anti-intellectual atmosphere, but those exceptions are indeed exceptions. For the most part, Chinese companies stay perpetually one step behind their foreign competitors. Scores graduate from universities to find their education was useless. Manufacturing positions are now fewer because of rising wages and technological improvement; and bosses don’t want factory workers with degrees anyways. Like unemployed youth in the Middle-East did in 2011, young Chinese take to the streets. The government tried to avoid another Tiananmen by making sure universities didn’t become independent hotbeds for radical thinking. But their attempts to maintain social stability have backfired tremendously. These scenarios aren’t just possible, they’re already happening. Many I speak to say these endings won’t happen because the central government will step in and prevent the worst. But in spite of what many Chinese and most foreigners seem to think, China has one of the weakest central governments in the world. It must oversee tens of thousands of local fiefdoms, so even when the top leaders try to do the right thing, their orders get diluted, reinterpreted or ignored through multiple levels of corrupted bureaucracy. Like most groups throughout history though, the party is reluctant to give up any of its absolute power. It clings to the notion that it can use its power to launch internal crackdowns and scare corrupt officials straight. But this approach has been failing for decades. For every situation it rectifies, dozens more pop up. Only by outsourcing its supervisory role to commoners and media empowered by a rule of law enforced from the top can China’s model become sustainable. China is the frog in heating water and time is running out. Hopefully the laobaixing will realize stability at all costs is usually the most potent recipe for chaos. This basically means further reform in freedoms at home while taking a more hawkish approach abroad. This seems like a very plausible scenario. He also said he worries that some current players vying for greater power could be catastrophic for China, were they to be put in charge. While speaking with him I realized that when you hear about the Communist Party through only certain mediums, it’s easy to form the idea that they’re a unified monolith; when actually nothing could be further from the truth. He’s a very rational guy who pretty well represents an unsung wing of the Party – a wing that didn’t necessarily get into politics to abuse their power and line their own pockets. He has most of the same concerns I do about China’s future. He worries about nationalists hijacking the government and letting the current situation deteriorate further. Some would criticize him, saying that since he’s part of the system, he’s complicit in the bad that it does. But he seems to sincerely believe the Party’s power can be channeled for good; that people like him can steer it in the right direction from the inside. He and I don’t agree on a lot of the methods to get this done, but his heart is in the right place. However, sometimes forces from the outside make it harder for people like him. This is a dead-on assessment. Much of the foreign criticism toward China’s human rights is counter-productive. It backs Chinese leaders into a corner and forces them to take a hawkish anti-foreign attitude and even double-down on the practices being criticized. It drowns out the voices of reason who are trying to lead the country’s development in a positive direction. This, perhaps, is partly why there may be opposite directions for domestic and foreign policy with the new leadership. This isn’t to say foreigners should stop criticizing China. Far from it. However, things like congressional censures, which do more for US politicians’ campaigns than China’s human rights, are the opposite of constructive. A lot of the other criticisms over Chen Guangcheng were perfectly legitimate, but still counter-productive. It’s important to realize that substantive change in China can never be inflicted from the outside. The government and people alike would reject it on principle. The foreign media plays an important role in covering issues that Chinese media are either too scared to report or are directly barred from reporting. Dissemination of information is good. Calmly arguing how current policy is bad for Chinese people is good. But making fruitless public admonishments of the government is pointless and usually harmful. Every time a protester in San Francisco holds up a “Free Tibet!” sign they’re pushing the rational people in China further into the arms of the hawks. Things like petitions to free Chen Guangcheng and human rights groups blasting the government – their hearts are in the right place but their actions often result in the opposite of what they’re fighting for. Rational people within the Party need to have some room to maneuver and get their voices heard over the shouting of the hardliners. They’re the only ones that have any hope of reforming the Party constructively. And while it might be satisfying to see the corrupt bureaucrats and iron fists get their come-upins in a full-on rebellion, steady reform within the confines of the current system would be much safer and better for everyone. The Party isn’t some Darth Vader-run empire of evil. As much as I, and many others focus on the absurd and horrible things some quarters of it carry out, there are a lot of good people in the Party trying to get good things done. Reporting, objective analysis and pressure from foreign governments behind closed doors are the only things foreigners can really do to help those people improve China’s situation.